I always tell clients that just because the marriage didn't work out doesn't mean you can't co-parent effectively and have a healthy post-divorce relationship. It's very possible, but like everything when it comes to relationships, it takes two to make it work. A divorce attorney who coaches people who can't afford an attorney how to represent themselves with confidence and integrity. If you have children, then you know how difficult it is to be a parent. Parenting is hard enough when the marriage is healthy. Co-parenting is not just for divorced couples. It applies to everyone. But, when you're divorced and have to deal with parenting plans, child support, extra-curricular activities and custody issues, that makes parenting even more stressful. 1. Don't micro manage each other. 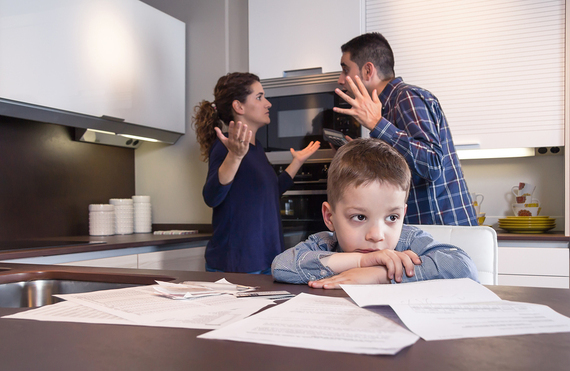 Divorced or not, parents often have differences about how to handle various situations with the children. Take your toddler not wanting to eat dinner and throwing a tantrum. One parent may say let the toddler go to bed hungry and that will teach him/her to eat. The other parent may say make something else because he/she needs to eat so they don't go to bed hungry. When you're divorced, the opportunity for parenting differences rises. The key is to remind yourself that you can't force your ex to be the parent you want him/her to be. They have their own style and parenting techniques. Unless it is legitimately harmful to the child, you should learn to work with it. That sounds harsh, but a court isn't going to give you full custody because your ex always feeds pasta for dinner on his/her nights. The sooner you understand and accept this, the sooner you will improve your relationship and the co-parenting dynamic. 2. Always do what is best for the children, not yourself. When you are dealing with conflict and you're not sure what to do, think about what is best for the children. The focus should always be on them, not you or your ex. Why? Because that's what most courts will focus on. Do you think your child would benefit from summer camp rather than doing nothing? Is contributing to the future education of your children important, even though you the court hasn't forced you to... yet? What about helping pay for that school trip even though you don't have to under your child support obligation? My point is do what is best for your children even if you are not obligated to by a court order and even if you're mad at your ex. It's not about them, it's about the children. 3. Don't get caught up in the minutia. If you were involved in a contentious divorce, you probably remember what it was like. Not fun, right? A lot of fighting over nonsense, or stuff that isn't important after the fact. You were married and know how to push each other's buttons. But, that doesn't mean you have to be the one doing the pushing, or react to your buttons being pushed. You are going to be parents forever, so don't get caught up in the day-to-day minutia. If you do, you will get burned out and just make things worse. It takes a lot more energy to fight and be angry. If you don't get bothered by most of the crap, you will find your co-parenting improves and your ex will change his/her behavior. 4. Remember, the children are people, not tools to use against your ex. This seems like common sense, but there are a lot of divorced parents who don't seem to get it. You may not like your ex, I get it. You're divorced for a reason, right? But, if you have children together, that doesn't give you the right to get back at your ex using the children a weapon against them. Don't do it. When you're in the moment, take moment and think about how you should react. Is it fair to your child to keep them from seeing his/her other parent on their weekend? Are you damaging your child's relationship with the other parent by disparaging your ex in their presence? Would you want your ex to do the same to you? Using your children to get back at your ex is how the seeds of parental alienation are planted. If you're not familiar with that term, Google it. It's not something you want to be accused of, or involved in. "Can you pick up John at 5 instead of 6 tonight?" "Can we switch this weekend for another one?" These are just two examples. Flexibility is key when it comes to co-parenting. Life happens and things come up. Remember, the focus should be on the kids, not on your ex wanting to change the parenting schedule. Unless this happens all the time, or you can't do it, try to be flexible when it comes to the schedule. There will be times when you will need a favor and schedule change. If you are nice to your ex, he/she should reciprocate and that how effective co-parenting works. Jason Levoy, a/k/a The Divorce Resource Guy, is a divorce attorney who coaches people without a lawyer how to get through the divorce process like a professional. Check out his answers to the most asked questions about custody and divorce.